First of all, I'd like to thank Christina and everyone who made such lovely comments on my white on white 96 year Birthday Card. I'll be sending that to Auntie in the next few days. By your response, I'm thinking she's going to love it! Thank you all again for your kind words and encouragement. This Christmas card is for my brother-in-law and sister-in-law. It is a 5x7 hinged card with a cream card stock base. The inside is lined, with the edges embossed using my small Martha Stewart scoring board and the gold accent in the corners are from Spellbinders Shapeabilities Lace Hearts. 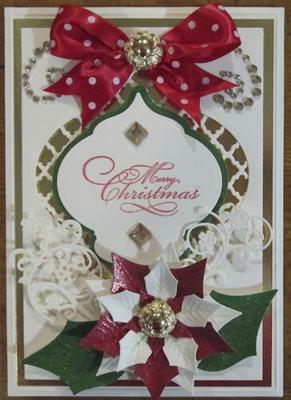 The front of the card I used all Spellbinders dies - 2010 Heirloom Ornament; Fancy Lattice; Fantastic Flourish One; and Layered Poinsettia. The ribbon and two gold buttons were in my "stash'. The bling I purchased at Hobby Lobby by K&C Company. That Bling, by the way, is very flimsy and difficult to use. The gold mirror card is from Hobby Lobby in their Art Dept. The package says poster board. The colored glitter card stock and the cream card stock were from Hobby Lobby. The brand was Paper Studio. And, I used foam tape between the layers. While I enjoyed very much making this card, I had spent all afternoon on it. Every time I thought it was done, I'd go back and look at it again and add something else or I thought Oh why didn't I emboss that before I put the lattice work on. But, in the end, I thought it turned out well and I hope you enjoy it too. 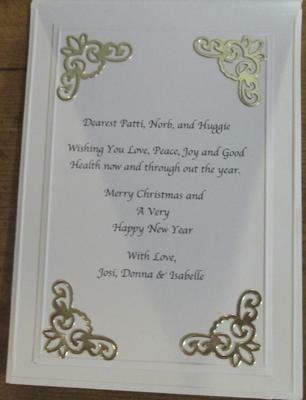 Well I think the cards is lovely and they will be really pleased with it when you present it to them for Christmas. I am sure that it will take pride of place on the mantle and will be treasured for a long time. Really love your Christmas card for your in-laws. I think they will be very pleased to receive it. Great card Donna, I'm sure your in laws will love it. This is a very warm looking card that will be enjoyed through out the season. Very detailed and you can see all the work that has gone into it . Very nice you have quite the talent. I think it is wonderful to have this web site up so we can exchange ideas and enjoy everyones talent. What a lovely feast of bling, bows and flourishes, such a lot of work has gone into that. I'm sure it will be appreciated. what a very lovely card this is! Your card is very appealing and it does not look as if you should have had any after thoughts about what if i should have done this or that. Colours are right for the season.